Following the invasion by a Viking army from Denmark in the late 9th century most of the East Midlands passed under the control of the Danish king and was known as the Danelaw. However in Bingham there is little evidence of the Danish presence. Mostly it survives among the field names still being used and recorded in the 1586 manorial survey. Those that are clearly of Scandinavian origin include Flatholme Leaze, in which holme is an island or marsh meadow, Brackendale in which both bracken and dale are Scandinavian, and Flashwong, from wong, the word for meadow. Some roads or streets are known by the Old Norse word gata, as in Church Gate and Chapel Gate, a usage still very familiar in Nottingham street names. In the western corner of the parish, on the west side of the Fosse Way, and near the tumulus recorded by Stukeley, stands the 'Moothouse Pit'. This substantial man-made depression was in existence by 1677, when it was believed to have been the meeting place of the wapentake of Bingameshou. The wapentakes, a Danish word, were administrative areas within Danelaw, roughly equivalent to the hundreds in Anglo-Saxon England. At these local meeting places land transactions and judgments on cases of theft and violence were made. The people of Bingham wapentake came from an area extending 20 miles across south-east Nottinghamshire from Widmerpool to Flintham. The pit takes its name from Mot-hawse or haugr, which is Old Norse for the meeting place at the mound, possibly a reference to the tumulus. It was first recorded in 1375. Mound is also indicated by the -hou element in Bingameshou. It is thus likely that the burial mound illustrated by Stukeley was used as the meeting-place of the wapentake before the pit came into existence and we might speculate that the site had an even greater antiquity as a meeting place, perhaps back into the pagan period, around 400-600 AD. Outside the parish, Tithby is the nearest village with a name with the distinctive Danish –by ending meaning ‘farm’. Most other nearby places have distinctly Anglo-Saxon names. However the name Saxondale - ‘the valley of the Saxons’ – is interesting as the use of the Scandinavian dale implies that it dates from the Viking period when a Saxon settlement was regarded as unusual. A quartz schist honing stone from Telemark in Norway was found during field walking, although it could have been brought here at any time between the 9th and 15th centuries. 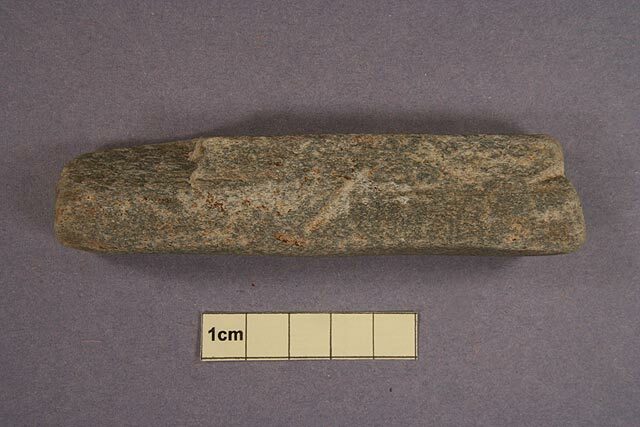 A sharpening stone thought to come from Telemark in Norway. A similar one has been found in an excavation in Nottingham and dated to 14th century. 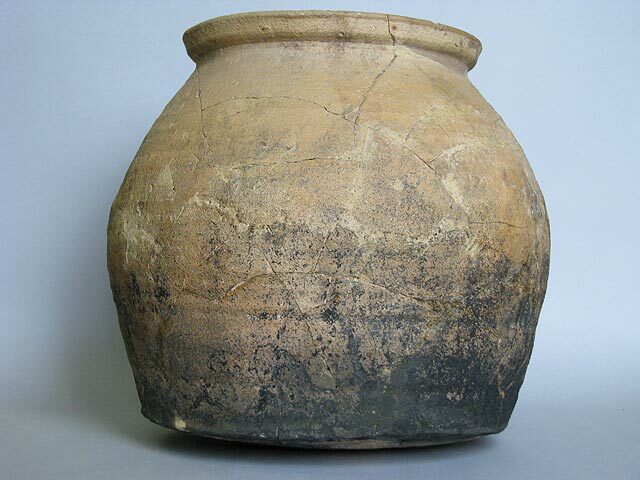 An interesting range of pottery types from the immediate pre-Conquest period was found during field walking, providing evidence of extensive trade links within England at that time. The pottery includes Lincoln kiln-type and Lincoln Late Saxon shelly wares, which have a date range of late 9th to late 10th century and are the closest dated. St Neot’s ware is late 9th-12th century and is right at the northern limit of its range here, possibly not arriving until the 12th century. The Lincoln early shelly ware and Derby-type ware are both from the 10th-11th century. The most numerous is Stamford ware. There are several types of Stamford ware, but in Bingham we find only A and B. Fabric type A, which is quite sandy, is the earlier with a range of 10th-mid 12th century and is usually considered to be pre-Conquest. Fabric type B has a date range of mid to late 11th –12th century and is essentially post Conquest. The distribution of the pre-Conquest pottery (Figure 3.25) seems to show that a major change had occurred in the parish by this time. The pottery sherds are widely spread across much of the parish, instead of clustering around settlement sites. Elsewhere in the Midlands, the dispersed settlements that characterised the earlier Anglo-Saxon periods had gone by the 9th century. The people concentrated in villages and it is thought that open field farming had started. It seems likely that this also happened in Bingham. The wide distribution of pottery for this period in Bingham would be the result of the pottery being spread with manure on newly created arable land. The date range of the earliest fabric types is late 9th – late 10th century, suggesting that village nucleation and the arrival of open field farming probably happened earlier in the 9th century. Not much pottery was used at that time. Cooking pots tended to be iron, liquids were carried in or drunk from containers made of leather, wood or horn and food was eaten off wooden platters. Because of this, if the broken pottery was disposed of on the farmyard midden, the small quantity available would have been spread far and wide on the newly converted arable land and clustering around settlements would not be much in evidence on a 10% survey. The finds distribution seen on Figure 3.25, therefore, probably shows widespread arable cultivation and possibly the arrival of open field farming, but it cannot conclusively be said that it indicates that village nucleation took place. Of the sites identified as Anglo-Saxon settlements only Margidunum and Granby Lane have more than a single sherd of pre-Conquest Saxo-Norman pottery. When Domesday Book was compiled, the lands and resources of Bingham were divided between three manors (estates), all held by Roger of Bully (de Busli). Prior to the Conquest the largest manor had been in the hands of Tostig, King Harold’s brother, and the two small manors held by Helgi and Holga. Together these manors comprised fifty-five families, six carucates (plough-lands notionally of 120 acres), wood-pasture of 1 league by 8 furlongs and meadow of twenty-four acres. The population is estimated at around 300; the total land area probably had roughly the same extent as the modern parish. There was no mention in the Domesday Book of a church in Bingham. The area of wood-pasture, mentioned in the Domesday Book, can possibly be identified in the western side of the parish by the absence of any finds from the period 10th to early 12th centuries (Figure 3.26). On the evidence of the distribution of Nottingham splashed ware (Figure 3.27), which came into production in the mid to late 12th century and continued into the 13th century the wood-pasture had gone by then. This conclusion is supported by documentary evidence that Bingham manor had an agreement with Haywood Oaks in Sherwood Forest for the supply of wood in 1237. A Nottingham splashed ware jug, 27 cm high, 17cm maximum width, dated 12th- early 13th C. The rim where the pouring lip might have been has been broken off, but the handle scars can be seen on the right hand side. WL170. Nottingham Brewhouse Yard Museum. 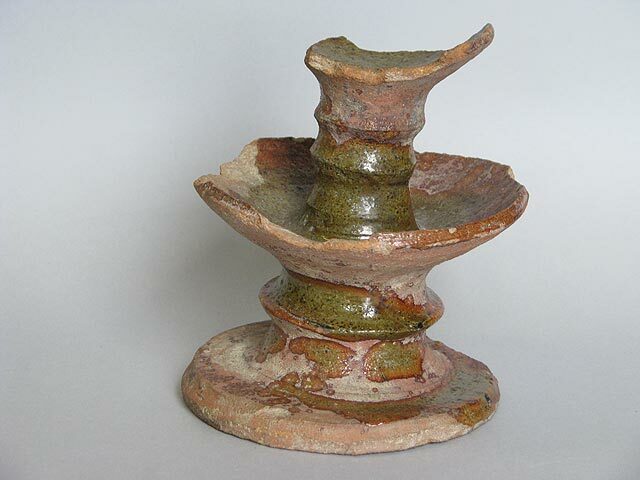 Nottingham Splashed Ware candle holder , 16 cm high. NCM 1959-1, Nottingham Brewhouse Yard Museum. The spread of sherds from the 12th to early 13th century is wide enough and abundant enough for meaningful distribution analysis of the finds collected during field walking. The interpretation of the distribution patterns is predicated on the assumptions that the general spread of pottery sherds is a result of distribution with farmyard manure and high concentrations of finds will be found in settlements, close to the source of the manure. This is the first period when any of the early Anglo-Saxon settlement sites become visible again. There are fairly high isolated concentrations of mid to late 12th to 13th century sherds at Margidunum and Granby Lane. Whether these signify the establishment of new farms here or the continuation of occupation since the Anglo-Saxon times is not clear. It is also apparent from the distribution of the 12th-13th century sherds that the area due south of Bingham village, in what in the 16th century was the arable, open South Field, has a higher concentration than anywhere else. The conjectural western boundary of South Field shown in our maps for 1586 closely coincides with the presumed eastern edge of the area of wood-pasture based on the absence of finds. 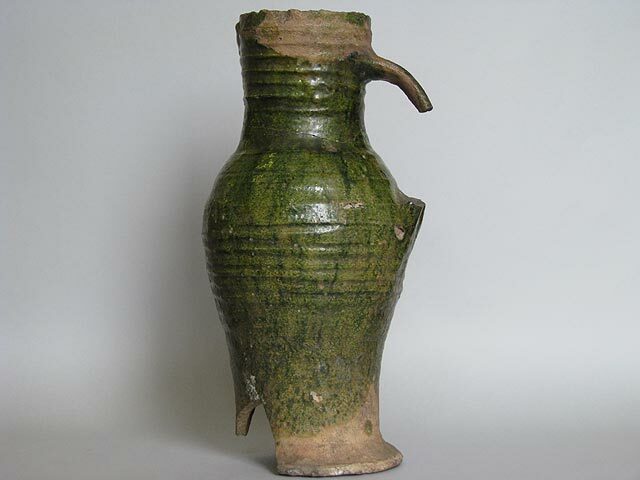 Nottingham light-bodied green glazed baluster jug; 32 cm high; 14cm max diameter. Dated late 13th C. NCM 1878-314/8, Nottingham Brewhouse Yard Museum. The early/mid 13th to mid 14th century pottery scatters (Figure 3.28) are the densest until the 19th century and show a very clear distribution pattern. 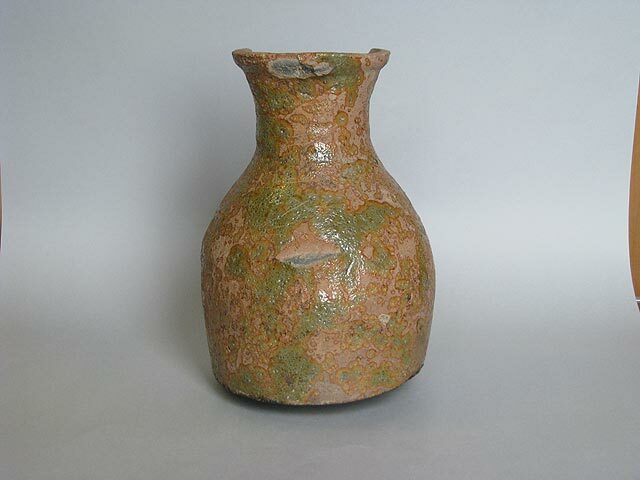 These were mostly Nottingham-made fabric types such as green glazed ware and coarse sandy ware. (see photo above) The extent alone shows that much of the parish was under arable cultivation. Some areas in the north of the parish over the lake deposits are completely free of finds and were probably maintained as meadow. This was certainly so for this area in later centuries. 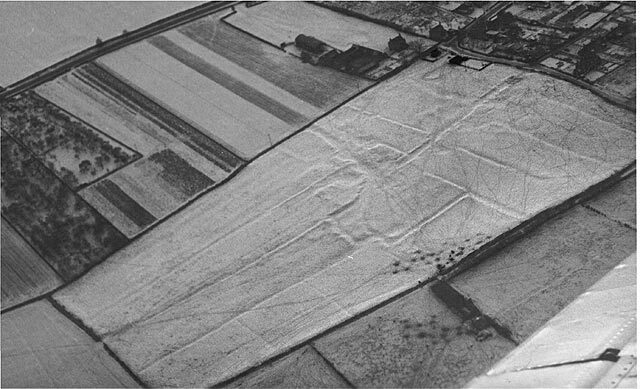 Ridge and furrow, which would have arisen from the medieval ploughing methods, was once extensive and can be seen on old air photographs of Bingham. Hardly any is now left. 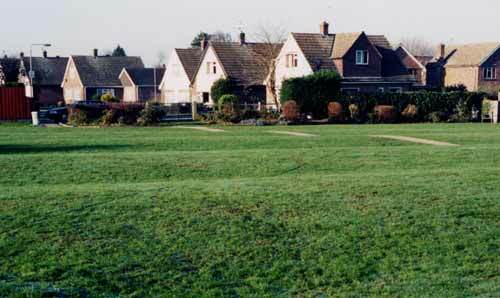 The best preserved is in Carnarvon playing field (see photo below) near Orchard Avenue and in Crow Close. It is during this period that the present parish church was built, the only building from this time now left standing. One of two examples of ridge and furrow remaining in Bingham is to be found in Carnarvon Playing Fields, near Garden Road in the west of Bingham. Air photographs taken before the housing developments show that ridge and furrow was extensive in this area. The ridges are aligned north-south, which is up hill and good for drainage. Ridge and furrow occurs naturally as a result of Medieval ploughing practices when it was customary to use an asymmetrical mouldboard plough drawn by eight oxen. However, the same effect was achieved by the practice, after Enclosure, of dividing private fields into strips called steches. This locality in within the Medieval Chapel Field, but with such a small area preserved it is difficult to be sure that it is Medieval in origin. When examining the distribution pattern of pottery from this period, Margidunum, Parson’s Hill, Granby Lane and Lower Brackendale all stand out with isolated, high or fairly high concentrations. Near the Saxondale roundabout a new area with a high density of finds emerges. There is no evidence from within the parish that this last site has a long history of occupation, though immediately opposite, across the A46, pre-build excavations carried out prior to the construction of the new A46 revealed evidence of Iron Age and Romano-British occupation sites (report awaited). Within South Field there is, as earlier, a high overall finds density compared with the fields that flank it. Studies elsewhere suggest that the density of finds in arable open fields is proportional to the population of the source village. Though there is only slight evidence of the existence of a village on the site of modern Bingham prior to 1100 AD, it is likely that by the 13th century it was the major settlement in the parish. If the area of South Field were farmed from Bingham village this would explain its high density of domestic waste in the soil. Significant changes in the distribution patterns of finds are seen on maps for the period after the Black Death of 1348-49. Gritty ware (Figure 3.30), which came into production in about 1350, is absent from several areas of the parish including Parson’s Hill. It is assumed that these areas had returned to pasture or wasteland as a result of the diminished labour force available for arable agriculture. The clusters around Margidunum, Saxondale roundabout and Lower Brackendale are still evident, but it is less clear at Granby Lane. By the late 15th century, using the distribution of Midland Purple ware (Figure 3.31), only the ancient settlement site at Margidunum is in evidence. Gritty ware cooking pot with soot stains. 29cm high. NCM 1966 140/4, Nottingham Brewhouse Yard Museum. One possible model for the history of settlement for the medieval period is that at some time prior to the late 9th century the dispersed Anglo-Saxon settlement sites were replaced by a single nucleated village, possibly where Bingham church now stands. Then in the 12th century new farms began to appear around the parish boundaries. These remained until the Black Death. It was this disaster that started their depopulation, leading to a time in the late 15th century when the only place in the parish where anyone lived was Bingham village. The question that has to be asked, however, is why the new farms were established at sites that had a long-standing history of settlement prior to the 9th century? While it is usually considered that the name Bingham is Anglo-Saxon in origin there is no evidence of where the original village or settlement was sited. The street plan of modern Bingham town centre is that of a medieval planned village. It had a main street, called Husband Street in 1586 (now Long Acre and Long Acre East), two parallel back streets, (The Banks on the south and Market Place, Church Street and East Street on the north) and several lanes linking them. There is very little evidence to date the building of this village. Direct archaeological evidence from this period in the centre of Bingham is sparse, but includes two brooches (see photo below) found with a skeleton possibly of a murder victim, near Market Place and dated to the 13th-14th centuries. The oldest surviving building in the village is the church, on which work started in the early 13th century. The font in the church is dated at around 1100AD, suggesting that there was a church here before the 13th century. The only archaeological excavations carried out in the village are on Long Acre behind the Chesterfield Arms, where Nottingham Splashed Ware was found in ditches suggesting that the land there may have been occupied in the 12th century. This possibly can be used to give a minimum age for the existence of Long Acre/Husband Street, which means that the planned village could date from the 12th century. This does not rule out the possibility that there was already a village around the site of the church. 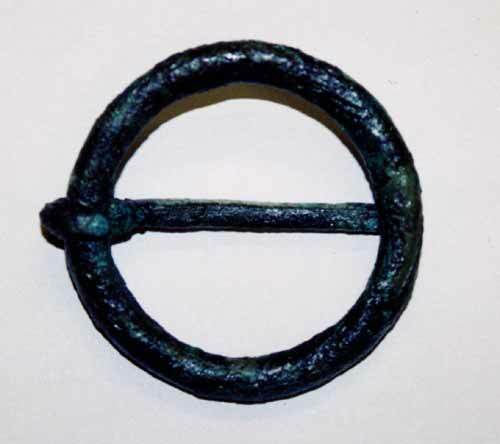 This 13th - 14th century bronze brooch, nearly 5.1cm in diameter, is one of two found with a skeleton unearthed during building work at the back of the Handicentre on Market Place on 20th August 1982. One was in the vicinity of the shoulders, the other near the hip. They were probably used to fasten clothing. The skeleton was face down and orientated north-south in a shallow grave and is thought to have been a victim of a murder. He was a stocky man in his mid 20s. Poor enamel on teeth might indicate infant illness. Signs of calculus on wisdom teeth suggest a long illness during which he ate only soft foods. The best evidence for the history of Bingham village before the 12th century comes from field walking. A marked change in the distribution of finds took place in the 9th century. Prior to that the finds were clustered around settlement sites. From the 10th century they were spread evenly around the parish, which suggests that open field farming might have been practiced by then. We only have firm evidence about open field farming in Bingham from the 1586 survey documents, but in the 10th century the area that in 1586 was called South Field was well scattered with finds and from the 11th century had a higher density of finds than the fields on either side of it. Work elsewhere and referred to above, suggests that the amount of domestic waste included in manure increases in proportion to the population of the place that supplied the manure. The implication from this is that South Field was supplied with manure by the place with the highest population in the parish. There are no indications of a village anywhere close to South Field other than to the north of it and it is reasonable to conclude from this that the village of Bingham existed roughly where the present day town centre is in the 10th or at the latest the 11th century. Despite the continued existence of outlying farms it was Bingham village that grew into dominance in the parish. There are certain advantages in its position. It is central to the parish and it is built on the water-bearing Hollygate Sandstone. There is only one period in its history when there was a resident Lord of the Manor. This was Richard de Bingham, the son of Ralph Bugge, himself the son of a Nottingham wool merchant of the same name who acquired the manor in 1266. Sir Richard de Bingham, an important figure in the county, was settled in Bingham between c.1275 and 1320. Though the family continued to own the manor until they died out in c.1380 none of his descendants lived in Bingham. Both before and after this period the estates would have been run by stewards or bailiffs, some of whom were relatives of the lord. Sir Richard’s manor house is thought to have been on the north side of Market Place. The town acquired its market charter in 1314, which was during the period his family was in residence here and he may well have built or modernised the Market Place. He certainly contributed to and would have been a driving force behind the completion of the new church. Crow Close, described as a deserted medieval village in the early 20th century, was the first to be recognised in England. Its existence has lead to speculation that it may have been the original site of Bingham. Recent research, however, has cast some doubt on this interpretation. Air photograph of Crow Close from the north east, showing the hollow ways, field boundaries and remains of buildings. Original photograph is at the Cambridge University Collection of Air Photographs, Unit for Landscape Modelling. While the greater part of Bingham manor has been in the hands of a single owner since the Norman Conquest, there appears always to have been freeholders in the manor. Several sokemen, who were the predecessors of freeholders, are listed in the Domesday Book, but the first firm evidence that there were freeholders owning land in the parish is in1450 when a survey of Bingham lists William Porter as the largest freeholder in the township and John Porter as having a smaller free holding. The 1586 Survey does not itemise freehold land in detail except in the survey of open field strips, but it lists Robert Porter as the largest freeholder, saying that he had also recently purchased another farm that was formerly in the possession of John Sertaine. The 1586 document lists a close owned by Robert Porter describing it as, “A messuage and 5 bovates of land and 5 bovates of meadow where he lives”. Our mapping work identified the most likely location for this as Crow Close. The Hearth Tax returns of 1684 show that ‘Mr Porter’ had a house of six hearths, the second largest in Bingham. In 1851 Andrew Esdaile categorically stated that Crow Close ‘was the Porter Estate’ and ‘formed no part’ of the Chesterfield Estate. The Porters lived in Bingham until 1754, when the estate was inherited by Henry Sherbrooke of Oxton. It is likely that the house fell into disuse from then. A close examination of the topographical and geophysical maps produced in the History of Settlement project give support to the conclusions reached by a study of the documentary evidence. Although it cannot be said with certainty that there is no deserted medieval village on the site, the earthworks so clearly visible in the field, can be interpreted better as the remains of a post-medieval house, estate buildings, field system and estate roads than as representing a deserted medieval village. Full details of the survey of Crow Close and an analysis of the data can be had by clicking here.